Bloss Memorial Healthcare District (BMHD) located in Atwater, CA was initially established in 1936 with a trust fund donated by cattle ranchers, Mr. and Mrs. George and Christine Bloss Jr. By 1960, the hospital evolved into a twenty-three (23) bed acute care district hospital. With aggressive competition from neighboring hospitals, low occupancy rates, cost-cutting reforms in federal programs and managed care insurance plans Bloss ceased inpatient operations in March of 1998 and re-open its doors as an out patient rural health care facility. After the hospital closed BMHD continued to expand its primary care and dental services as a rural health facility. In 1998 due to government changes, the air force base known as Castle Air Force Base located in Atwater, CA closed its facility. Bloss was approached by the government to acquire the existing hospital facility on the base. With this new facility Bloss re-named its rural health centers as “Castle Family Health Centers” and relocated its services to the base and began an aggressive campaign to expand its primary, specialty and dental services. With some out of the box thinking, in 1999 Bloss created a program to which it transformed the Operating Rooms of the hospital into an Ambulatory Surgical Center dedicated strictly for the dental treatments of children. With the support of the dental community and pediatric partners, the Surgery Center became an excellent alternative for children who otherwise could not be treated under conventional means. The children usually range from ages two to ten, some are compromised with severe medical problems or behavioral and/or developmental situations, but all children are treated with the utmost compassion, care, and understanding. In 2010 Bloss gave up oversight and ownership of its rural health center operations to a newly formed federally qualified look alike organization known as Castle Family Health Centers, Inc. Bloss became the landlord to the new organization who currently operate all the health care operations within the Bloss facilities. In 2010 Bloss also became 2/3 owner of its second dental surgical center in Stockton, CA known as the Children’s Dental Surgery Center. Bloss has two full time Surgical Centers with a team of dentists, anesthesiologists and support staff. 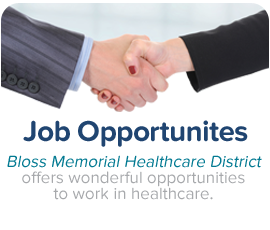 In 2018 Bloss Memorial Healthcare District sold its interest in both the Central California Dental Surgery Center in Atwater and the Children’s Dental Surgery Center in Stockton. After 19 years Bloss has been proud to treat over 76,000 patients successfully within its two surgical centers.